Prince George and Princess Caroline (the future George II and Queen Caroline) came to Richmond in 1718 – the first step in a sequence of events that would lead to, among other things, the creation of Kew Gardens. We’ll be celebrating the Hanoverian royal family and their 100 years at Richmond and Kew with a talk, on Monday 8 October, by Susanne Groom, who lives in Kew and is a former curator at Historic Royal Palaces. In 1718 the Hanoverian new royal family made a summer home for themselves in Richmond. 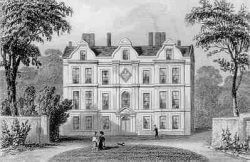 Through the succeeding three generations they remained in the area until November 1818, when Queen Charlotte died in Kew Palace. What drew them here in the first instance? What did they find to do? How did they change the area? And what legacy did they leave behind? These are some of the questions Susanne Groom, a curator at the Historic Royal Palaces for almost 25 years, will be answering in her talk to the Society. Away from the formal drawing rooms and levees of St James’s, Richmond offered an opportunity for each generation to enjoy some kind of family life of their own making. At times it provided a refuge from failings out with other royals, or merely a respite from politics and the public gaze. In Richmond the royal family lived through golden summers of happy domestic joy and also through the most desolate periods of alienation, illness and despair. As this was a private place, most of what went on in the various houses and gardens of Richmond and Kew remains hidden, but there are tantalising glimpses, occasionally from first-hand witnesses. There are slithers of information lurking in forgotten diaries and letters, and details of domestic changes and habits can be prised from bills and accounts in The National Archives and at the Royal Archives at Windsor. Together they help to tell a tale of these Germanic incomers who, over centuries, helped to form Richmond’s rich heritage of which we are so justly proud today. Susanne co-authored At the King’s Table: Royal Dining Through the Ages, which was the subject of her talk to us in December 2013, Discover the Gardens and Kew Palace: The Official Illustrated History. This entry was posted on 8 October 2018 by Robert Smith.